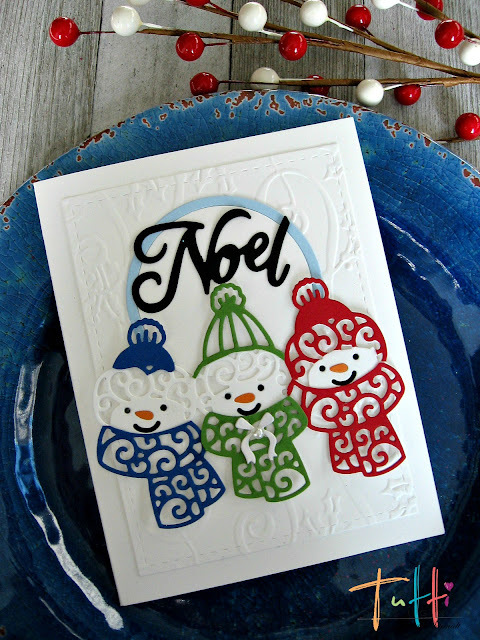 Laurie here from Stamping Up North, and today is my first post as a designer for Tutti Designs. I'll be here every Friday sharing a project I've made with these amazing dies! I love how well they cut and how beautiful they are. AND they are SO fun to play with! I chose to make a card with the Snowman Trio. I think they are such cute pals, and I had fun dressing them up in different colored hats and scarves. I cut the trio out in red, green and blue, and used a white one for my base. Then I cut out the scarves and hats and adhered them onto the white. I inlaid the mouth,nose and eyes.
. The sweet tiny bow is actually from The Gifts Under the Tree die. I added a pearl in the center. I cut out the sentiment in black from the Snowglobe Expressions set, which is quickly becoming a fave of mine! The fonts are awesome, and I love the size...so perfect for many projects. And that snow globe...it's adorable! The sentiments fit right inside. 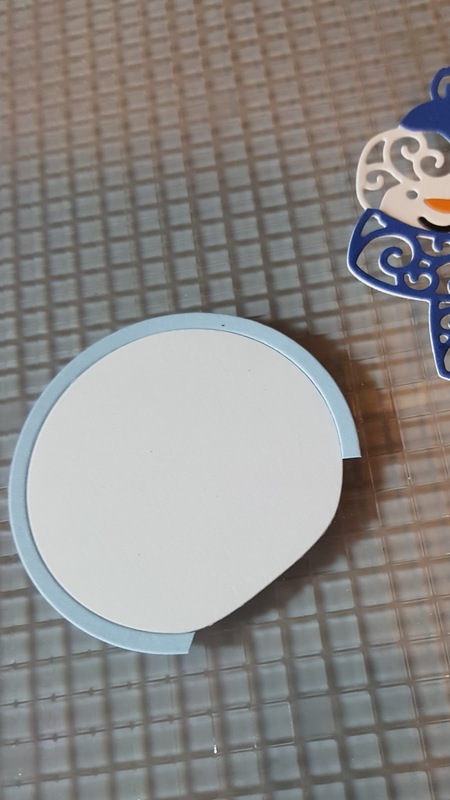 Then I cut out the snow globe in white and blue, and cut the bottom blue base off, to use as a back for my sentiment. I adhered it onto an embossed background that I had cut out with a stitched rectangle. Then I adhered the sentiment and snowman trio onto that! 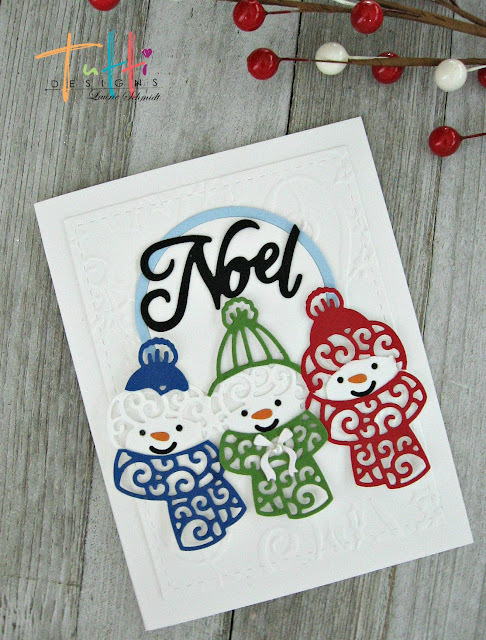 I hope you will join me next Friday when I share some fun snow globe tags. Beautiful & fun way to start us off Laurie! 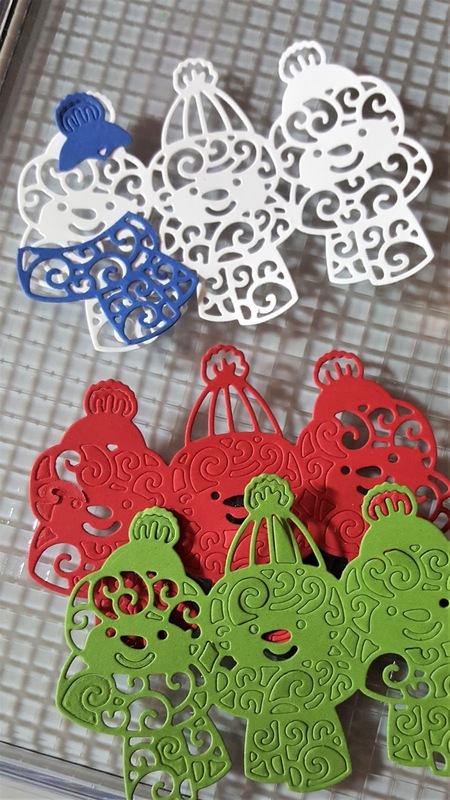 Great use of these fun dies! Awesome inspiration ... thanks! This is just the cutest card Laurie! 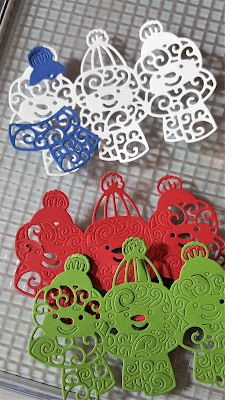 Loving the bright colours you have given these wee snowmen. 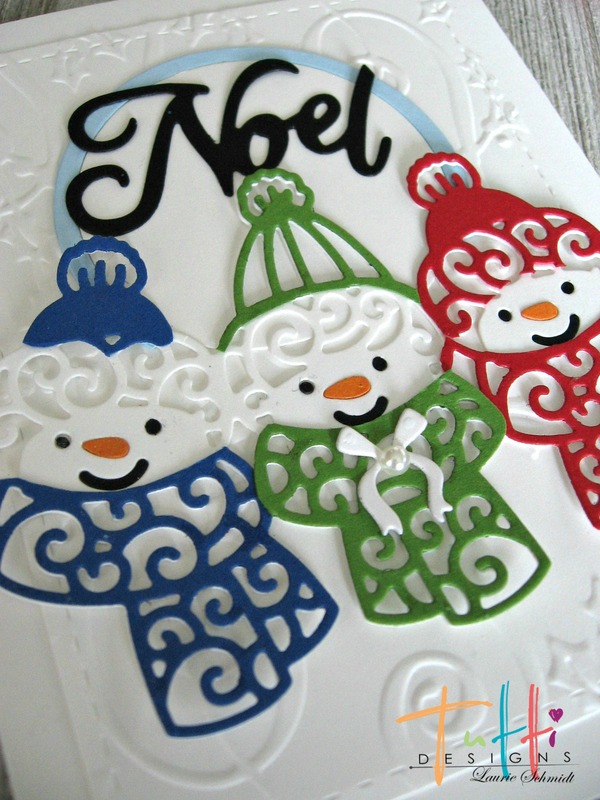 These snowmen are cutie patooties! Congratulations to you and Tutti on your new assignment. You'll make beautiful music together! Your snowman card is adorable, Laurie!! The Snow Globe Expressions Set is one of my favorite.